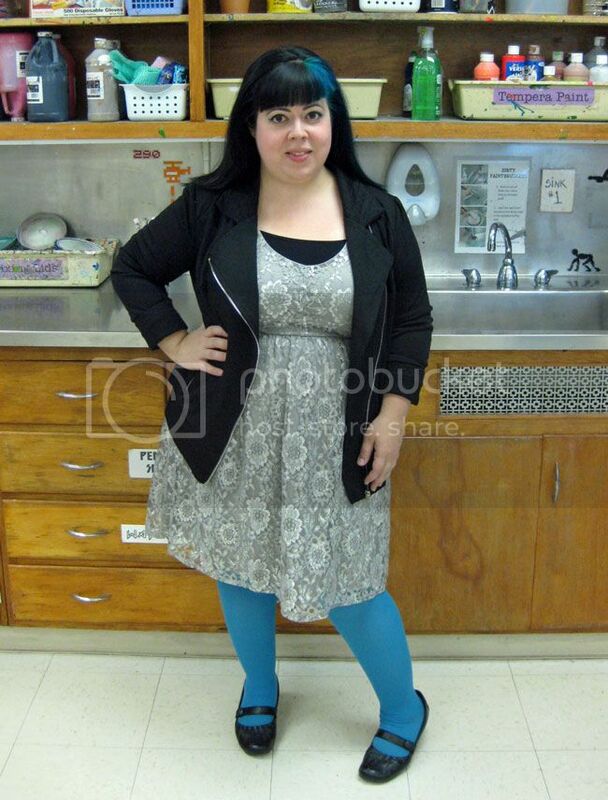 dress - Torrid / tank - JCPenney / tights - We Love Colors / jacket - Target.com / shoes - Shoe Carnival? I bought myself this black motorcycle-style jacket from Target.com after spotting it on Pinterest. It kind of bugs me that Target has these internet-only exclusive items, because I have a Target right by me, and I'd love to be able to try stuff on, instead of buying it online and crossing my fingers, hoping for the best. Also, Target had some amazing halloween dinnerware and by the time I found it online ($95?! You've gotta be kidding me, jerks! ), it was already sold out/no longer available. Boooo. And not in the halloween sense. The arms on this jacket are a little tight, but I wouldn't want to go up an entire size just because of that. Plus, I like to push my sleeves up, and I don't think this is the kind of jacket that's meant to do that. 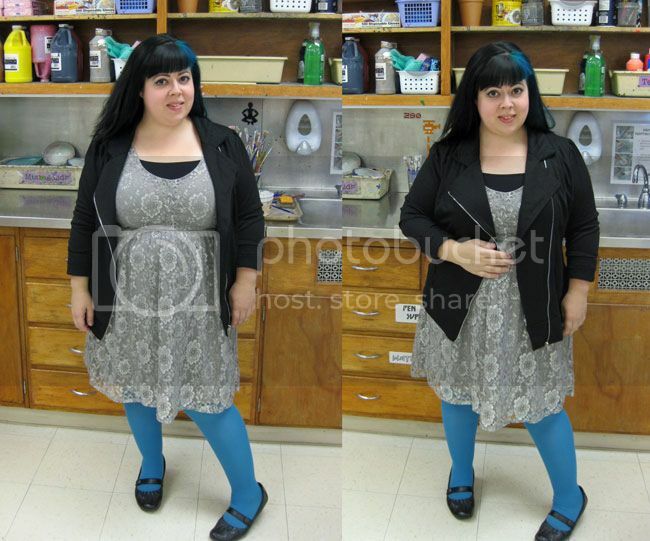 This dress is from Torrid last spring... I bought it on clearance when I was shopping for other stuff, so I was like, "$40? Okay!" and purchased it on a whim. It's cute, I like the gray/silver sparkly motif, but it's a little bit long on me. I'd like to take it up just an inch or two, but I'm not sure if it's worth the hassle. I almost gave it away at a clothing swap a few weeks ago, but then I was all, "oh I haven't taken any photos in this," so I decided to wait. And then like two different people told me that they liked my dress this day. It's always weird when that happens because I was sure that I was pretty much done with it, but then you think differently, like maybe other people see something you don't. Argh. 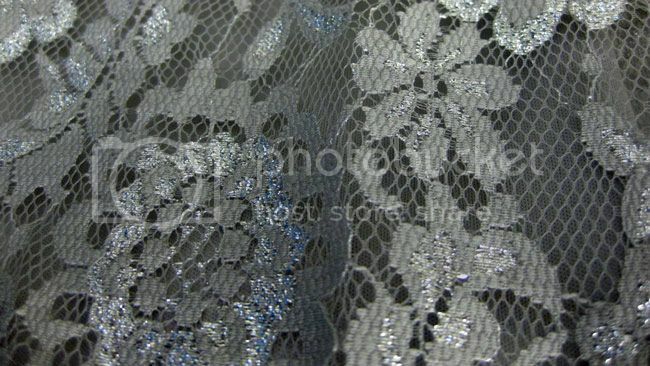 Close up of gray/silvery sparkly lace. Below, details of my jacket. I love the quilting on the collar (it's also on the arms, by the cuffs. I'm a sucker for asymmetrical balance, so a motorcycle jacket like this is perfect for me because it zips up across the body on one side, as opposed to a typical jacket with a center zipper. 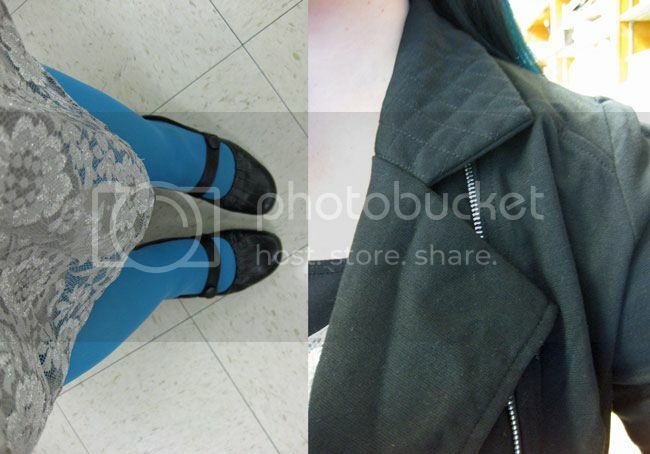 I think the blue tights make an otherwise drab color palette a little bit happier.